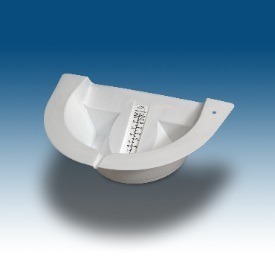 Plasti-Pan provides a convenient and accurate method of collecting and measuring urine output. Sturdy - Made of virtually unbreakable polypropylene. Easy to Read - Graduations clearly printed in large numbers. Graduated in both ounces and ml. Large Collection Area - Back wall angled at 30 degrees increases surface area to assure complete collection and accurate measurement of specimen. Back to Back Collection - Plasti-Pans may be placed back to back in toilet bowl to allow simultaneous collection of stool and urine. Easy Pouring - Functional pour spout allows accurate pouring into smaller containers.